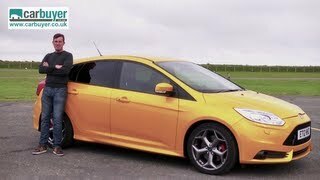 Ford unveiled details about the new Ford Focus ST which will share the stage at the Paris Auto Show 2010 along with Ford Mondeo and Ford C-Max. Back in 2010 Geneva Auto Show, Derrick Kuzak, Ford's vice president promised that an exciting new performance version of the next generation Ford Focus was in developement. 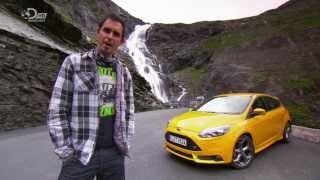 Now, we know that the next-generation Ford Focus ST was the model he was refering to. The new range-topping Focus ST features a 250 PS version of the new 2.0L 4-cylinder Ford EcoBoost engine and is targetting to offer the driving enthusiasts an exhilarating performance and handling accompanied by an addictive sound. 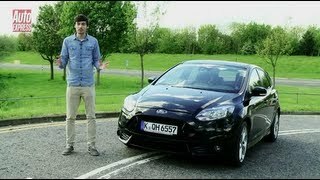 The new Ford Focus ST is expected to launch in early 2012. Cologne, September 15, 2010 – The exciting new next-generation Ford Focus range is the star attraction in Ford Motor Company's display at the 2010 Paris Motor Show on September 30. For the first time, the complete global Ford Focus line-up of three production-ready dynamic bodystyles will be displayed together, providing customers with a full insight into this significant new model before it goes on sale in Europe and North America early in 2011. Ford is also delivering on its promise to introduce a global performance version of the new Focus with a world premiere for the exciting flagship of the range, the muscular 250 PS Focus ST. The dramatic new ST will launch in early 2012 and will be revealed on September 30 at the Ford stand by Alan Mulally, Ford’s President and CEO, and Stephen Odell, Chairman and CEO, Ford of Europe. The formal launch of the full production-ready Focus range in Paris is highly significant for Ford, as it signals the introduction of the first truly global product developed under the Company’s ONE Ford strategy. 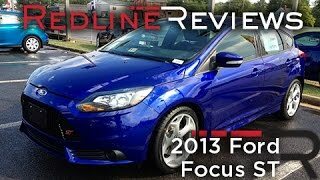 The Focus is Ford's most significant car range globally. Developed at Ford's Global centre of excellence for Small Cars in Germany for sale in over 120 markets worldwide, the next-generation model is the most important Focus yet and is created from Ford Motor Company's new global C segment platform with up to 80 per cent parts commonality around the world. This platform will underpin at least ten vehicles globally and account for some two million units of annual production by 2012. With the complete range of three bodystyles on display in Paris for the first time – sporty five-door, elegant four-door and stylish wagon – show goers will have an exclusive opportunity to see and experience the car’s individual design and class leading technology first hand. New Focus promises to outsmart its competitors by offering more affordable technologies and features than customers have ever experienced in this critical vehicle segment. Next-generation Focus also offers customers the highest standards of quality and detailed craftsmanship, plus outstanding fuel economy, and will take the legendary Focus driving dynamics to a new level. At the 2010 Geneva Motor Show, Ford Motor Company's group vice president for Global Product Development, Derrick Kuzak, promised that an exciting new performance version of the next generation Ford Focus was in development. At Paris, Ford is delivering on that promise by revealing an early preview model of the exciting next-generation Ford Focus ST. Targeted for launch in all global markets from early 2012, the all-new Ford Focus ST will be Ford's first high-performance model developed under its global Performance Vehicles strategy. The new range-topping Focus – which features a unique 250 PS version of the new 2.0-litre, four-cylinder Ford EcoBoost engine – will be completely true to Ford's ST heritage, offering driving enthusiasts an intoxicating cocktail of exhilarating performance and handling accompanied by an addictive sound. Visitors to the Paris display also cannot fail to notice the show car’s highly distinctive sports exterior, which is finished in 'Tangerine Scream', a dramatic new body colour that reflects the new ST’s exciting and energetic character. Taking their place alongside the next-generation Focus family will be five-door and wagon versions of the new Mondeo range, which was previewed at the recent Moscow International Automobile Salon. The Paris show sees the debut of the ultra-low CO2 Mondeo ECOnetic version. The Ford stand also showcases the latest S-MAX and Galaxy models which were launched earlier in 2010. The all-new Ford C-MAX and Grand C-MAX will be represented by high series Titanium models fitted with a Ford EcoBoost 1.6-litre 180 PS petrol engine and the updated 2.0-litre Duratorq TDCi diesel. Bringing new levels of style and desirability to the compact Multi-Activity Vehicle (MAV) market, the all-new Ford C-MAX is the first production model using Ford's exciting new global C-segment platform. The Grand C-MAX also goes on sale in North America in late 2011. Ford is accelerating its efforts to minimise fuel consumption and CO2 emissions across its product range, and two important new entries to the Ford of Europe product portfolio are being displayed at Paris – a new Ford Mondeo ECOnetic model and a new Ford Ka derivative with standard Ford Auto-Start-Stop system. These new models follow the significant new developments which have already been introduced during 2010, including the launch of the new high-efficiency Ford EcoBoost turbocharged direct injection petrol engine family and completely updated versions of the powerful yet highly fuel-efficient Duratorq TDCi diesel engines. Ford is also moving forward with its European electrification program and will be displaying for the first time the core technology destined to drive its C-MAX PHEV (Plug-in Hybrid Electric Vehicle), that will be produced at the Valencia plant in Spain and is due to go on sale in Europe from 2013. Along with the wider introduction of low-CO2 Ford ECOnetic Technologies such as Eco Mode and Smart Regenerative Charging, Ford of Europe is on track to surpass its goal of a 30 per cent reduction in CO2 emissions from its new vehicles by 2020, relative to a 2006 model year baseline. "The launch of the complete new Focus range, plus the global debut of the high-performance ST model, makes this Paris Show not only very exciting for Ford, but also highly significant," said Stephen Odell, Chairman and CEO, Ford of Europe. "With the all-new C-MAX also on the Paris stand, along with the latest Mondeo, S-MAX and Galaxy models, it’s clear that the pace of change within Ford remains as aggressive as ever."